The owners of Via Tevere Pizzeria located on Victoria Drive, serving some of the best Neopolitan Pizzas in the city, have rolled out a new food truck called Via Tevere Express. 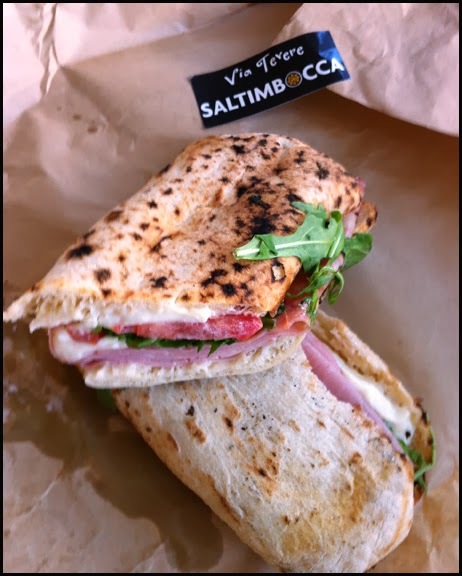 Instead of serving Neapolitan pizza, Via Tevere Express focuses on Saltimbocca sandwiches which makes use of an oven in the truck. What’s unique about Saltimbocca sandwiches is the bread. It has similar charring (leoparding), crispiness and chewiness as the crust of a Neapolitan pizza, albeit a little thicker. In essence, if a Neapolitan pizza was an open face sandwich, then Saltimbocca would kind of be like the pizza folded like a book. After visiting Via Tevere Express twice, I have decided sometimes keeping it simple is the best option. For my first Saltimbocca sandwich I ordered the one with the most filling. It had prosciutto cotto (cooked ham), salami, mortadella, mozzarella, basil, arugula, tomatoes and topped with mayo. I watched them put my order together and place it into the oven in the truck. 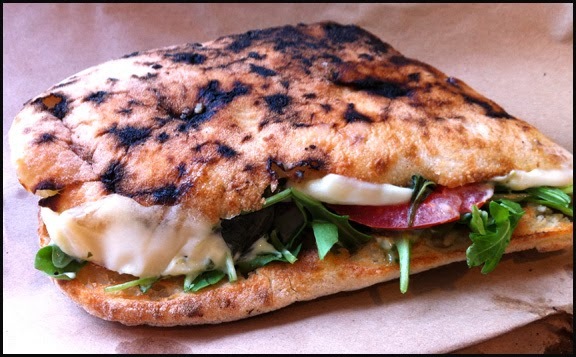 The sandwich was warm and had a crispy exterior with the burnt spots you would expect in Neapolitan pizza. All the ingredients were of good quality. The sandwich was filling and hearty. However, I felt all the salty savoury cold cuts in the sandwich obscured the most distinct feature of the Saltimbocca: the bread. The texture and flavours of the oven toasted bread got lost in the shuffle with all the other ingredients. Without highlighting the distinct bread, I felt this sandwich was just another well prepared sandwich that you can easy find downtown; no different than a good Panini. On my second visit, I decide to go the opposite route of my first experience. I picked the simplest Saltimbocca on the menu and ordered the vegetarian Caprese. This sandwich just contained mozzarella, basil, arugula, tomatoes and mayo. These ingredients created a filling that was milder and creamier than my previous choice; with the arugula adding just a pop of spiciness. More importantly, I felt the bread had had bigger role in the overall flavour. I could taste the slight bitterness from the burnt spots and saltiness of the bread. I enjoyed its chewy texture. With the Caprese, the unique bread was showcased and as a result made the sandwich standout in the sea of sandwich choices downtown. I never thought I would prefer a vegetarian sandwich over a meat option but in this case, less is more.